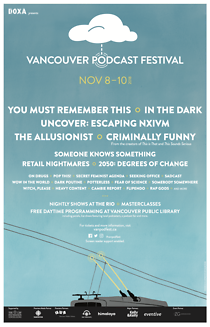 The Vancouver Podcast Festival is coming November 8-10, 2018. There will be live podcasts and events featuring shows like You Must Remember This, This is That, In the Dark, and The Allusionist, as well as masterclasses on interviewing, sound editing, and writing for audio. Check out the line-up here. This can be used for tickets to see Uncover: Escaping NXIVM, You Must Remember This, In the Dark, The Allusionist, and more! Apart from the Allusionist show, all of the Rio shows will present at least two podcasts per show. This is a really sweet deal! You get the student price for the three masterclasses, and on top of that you receive a festival tote, access to an exclusive panel for Creator pass-holders (on how to get paid as a podcaster), and access to the Creator Meet and Greet on the opening night of the festival! Also good to know: we do have a limited amount of Creator Passes. Masterclasses (included in the Creator Pass), are also available individually at a student discounted rate on the website for $20.